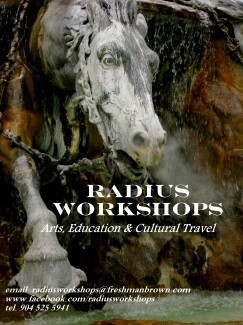 Louise Freshman Brown and Frederick Brown formed Radius Workshops in 2007. Louise has been teaching drawing, painting and collage workshops in Europe for 14 years and in the US for 25 years. Fred started cooking at workshops in Italy 8 years ago. Frederick has cooked professionally for more than 15 years, mostly in New York and in Europe. He was also the corporate sous-chef and an event-coordinator at Bon Appétite Magazine for 2 years. There he taught cooking classes, recipe tested, cooked for wine and food pairings and corporate events. As a coordinator, he worked producing food and wine events in cities across the country including Los Angeles, Chicago and Las Vegas. Frederick cooked in kitchens that produced the finest haute cuisine, but authentic country cooking is where his heart is, cooking simple food with stellar ingredients, peasant food, the recipes and food-culture that have been passed down from generation to generation through the millennia, that have somehow gotten lost in United States over the course of the last 4 or 5 decades. Louise and Frederick finally worked together in Sorrento, Italy in 2007 and it was there we decided to present tours and workshops of our own. Radius was born. As the term ‘Radius’ suggests, we strive to keep our guest’s experience within a certain locale. 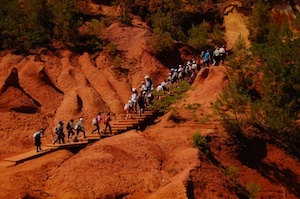 We want our guests to have an experience of place and culture, “Slow Tourism,” if you will. See, Smell, taste, feel, and literally drink it in—the terroir, the special characteristics of the earth that make it, and what grows from it, unique. The world is becoming so small, so same. Radius encourages people to take the time in one place to elicit the differences that still exist, the nuance of place. One must stop and enjoy the bounty of a region with all of one’s senses. Please take a moment to read about our programs and contact us if you have any questions or comments!